"I'm disappointed to see what has been proposed by the Boundary Commission. However they are not set in stone, a public consultation will finish in early December. The reason the Government have given for this cut in the number of MPs is the cost of politics. They estimate savings of £12m. 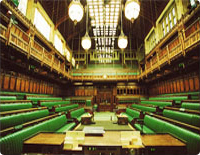 However, they are not proposing cuts in the numbers of ministers and MPs on the ‘payroll vote' As a result there will be smaller numbers of backbenchers of all parties to hold the Government to account. This is especially true, in this week, when unemployment has hit 2.5 million. Before now and the next General Election, I've the privilege of representing Leyton and Wanstead, and dealing with the problems faced by my constituents who are losing their jobs, having their bus services reduced and having their police numbers cut. These are the important issues I have to think about, between now and the next General election."